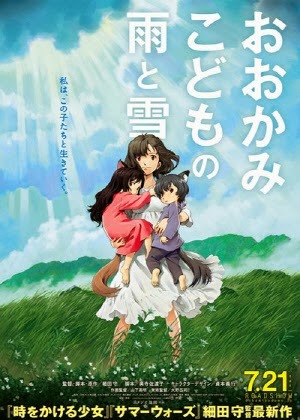 Wolf Children (おおかみこどもの雨と雪/ookami kodomo no ame to yuki), the third feature length anime from director Mamoru Hosoda is a gripping and heartwarming tale of cross-generational appeal. Essentially, anything you could think of saying to distinguish a work of fiction as a classic of its genre could aptly apply. Going over my NY Comic Con itinerary, I became wary of the movie’s FUNIMATION and Hero Complex sponsored screening when I detected the strong family friendly vibe of the anime. It’s not necessarily a bad thing, but after long days of navigating the crowded convention floors, one looks for the comfort of entertainment he is most naturally drawn to, and my tastes tend toward the darker, grittier assemblage of moving images. No matter. Wolf Children proved to transcend genre leanings. It revealed itself to be a multilayered work, supporting recent ripples of acknowledgment that Hosoda-san is well on his way to achieving status as a master of feature length animated films, putting his name in the same realm as one Hayao Miyazaki. Even the English dubbed version they decided to screen, which initially caught me off guard (though it really should not have been that much of a surprise considering the wide audience its releasing company must aspire to reach), did not end up hampering my enjoyment of the experience. That in itself is a huge testament to the power of the film. 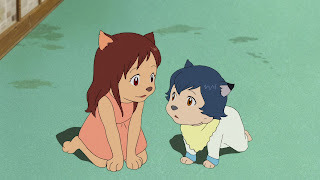 WOLF CHILDREN begins wrapped in a mood of idealistic romance as high school student Hana, speaking wistfully and mature beyond her years, falls into a whirlwind courtship with a werewolf. Their enchantment with one another supersedes the importance of fitting in with society around them (a theme that recurs tunefully throughout the film) and soon the pair are living the sort of life experienced by those who grow up too fast – raising two children in a cramped metropolitan apartment. Despite the couple’s upbeat attitude, invigorated by a sense of freedom, the feral qualities of Hana’s mate make him not long for the world around them and soon Hana is left to care for the two were-children alone. Her plight is easily relatable to the real life world around us, in which such supernatural creatures don’t necessarily exist: a single mother trying to take care of two very rambunctious children. Add to this the particularly Japanese norm of valuing fitting in and not disturbing the carefully structured order of things around you, and Hana becomes a truly empathetic figure. Here emerges another theme, that of going against the grain and forging an unfamiliar, potentially challenging path for the sake of one’s family, as Hana decides uproot her clan and move to a remote countryside. Here the children, Yuki and Ame (which mean ‘snow’ and ‘rain’ could indulge their wolf sides as they scramble about the wondrously depicted surrounding wilderness. Yet challenges of surviving this naturalistic setting abound: Primarily, yielding food from the earth and contending with savage bouts of weather. And although the rural community is portrayed as more compassionate than that of the city, it still presents a challenge for newcomers to fit in to its established ways. In contending with these obstacles, Hana is shown to be a strong, determined female protagonist who handles her interactions with members of the new community gracefully. Meanwhile, Yuki and Ame develop stronger individual characteristics. The older Yuki is brash, fearless and unashamedly comfortable with her wolf form. Ame, on the other hand, is a more timid, delicate younger brother. These traits follow them through to the start of their attendance at school. However, after the passing of some years, a thought provoking reversal occurs, one that speaks rather accurately to the gendered experiences of children. Yuki becomes self-conscious, determined to fit in, even if it means the suppression of her once joyously flaunted wolf form. This is especially when interactions with a boy in her grade begin to take place. At the same time, Ame, who has not grasped the same success at school as his sister, grows more and more detached from his classes. He finds himself drawn to the wilderness, much to the concern of his mother, where he pursues a connection to the animal side of his family’s history. Through these situations, school is viewed as another complex social structure with demands to fit in that are challenging, yet of critical importance. 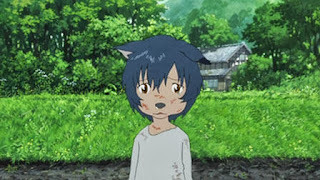 By telling a story with simple, joyous images for children to enjoy, true-to-life situations that adolescents can relate to, and themes of fitting in and dealing with identity crises that are substantial enough for adults to wrap their minds around, WOLF CHILDREN is an assured classic. An impressive feat is the complex manner in which children grow and change, something I do not find to occur in Miyazaki films I am familiar with. This is not a point of disparagement toward Miyazaki, but rather is something I find truly fascinating about Hosoda’s latest work. In terms of visuals, there is a unique color palette, which I also took note of in the director’s previous film Summer Wars, consisting of cool blue-ish grays and pastel colors. They are at once easy on the eye and suggestive of the more subtle shades of the films’ human subjects. 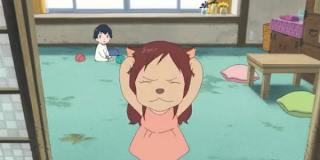 Then, there is the delightful style of animating the children’s transformation into their wolf forms. They morph quickly and with a sense of ease from human to creature forms, turning into large, roughly sketched circular shapes. Bouncing about frantically, they are immediately disarming. 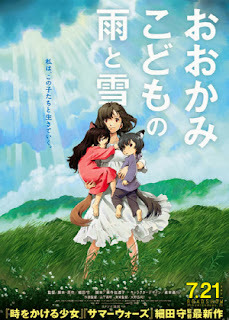 WOLF CHILDREN is a film I would love for you to be able to experience on the big screen. Then again, owning the DVD and being able to show it to future generations in a warm, familiar atmosphere would also be ideal. WOLF CHILDREN is now available on DVD and Blu-ray from FUNIMATION. Me on twitter = @mondocurry.